We all are victims of a work life that takes more from us than, perhaps, we can give. Long sitting hours, travelling in heavy traffic jams or crowded trains, mental fatigue and what not have become our doubles. To battle this and maintain a healthy work-life balance, there’s yoga to the rescue. 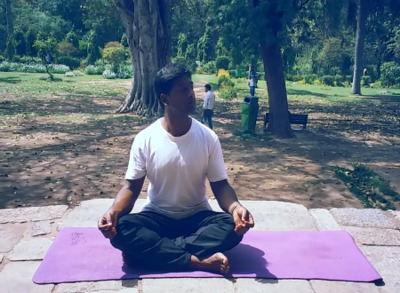 Here are some yoga asanas for managing stress and mental fatigue, which can actually transform you. a) Extend your right arm with your index finger erect and fist closed. Focus both your eyes on this finger. Move up and down for 8 counts. Repeat the same with your left arm. b) Move your arm around in clock-wise and anti-clock positions. Let your eyes focus on the index finger. c) In the third formation, let your arm move from left to right. Focus your eyes on your index finger. 1. Stand erect with your feet together and your arms at your sides. 2. Press your weight evenly across the balls and arches of your feet while breathing steadily and rhythmically. 3. Lift and spread your toes and the balls of your feet, then lay them gently on the ground. 4. Firm your thigh muscles and lift your knee caps, without tensing the muscles of your abdomen and then lift your inner ankles to strengthen the inner arches. 5. Imagine a line of energy all the way up along your inner thighs to your groin and from there, through the core of your torso, neck, and head, and out through the crown of your head. 6. Turn your upper thighs slightly inward. Lengthen your tailbone toward the floor and lift your pubis toward your navel. 7. Press your shoulder blades into your back, then widen them across and release them down your back. 8. Without pushing your lower front ribs forward, lift the top of your sternum straight towards the ceiling. 9. Widen your collarbones and hang your arms beside your torso. 10. Align the crown of your head directly over the center of your pelvis, with the underside of your chin parallel to the floor. Your tongue should be wide and flat on the floor of your mouth. Look slightly upward. 11. Stay in the pose for 30 seconds to 1 minute, breathing easily. 1. Stand with your feet together, inner ankles and inner knees touching. Find a straight line of energy through the center of the body, from the inner arches up through the crown of the head. Bring the hands together at the center of the chest in Anjali Mudra. Exhale, root down through your feet, and feel steadiness, firmness, and grounding in Tadasana, or Mountain Pose. 2. Shift your weight onto your right foot. Bend your left knee, and move it into the chest. Keeping a long spine, reach down and clasp your left ankle. Place the sole of the left foot on the inner right thigh. 3. Lengthen your tailbone toward the floor to stand tall and bring your gaze to the wall directly in front of you to help you balance. 4. Press your left foot into the inner right thigh and your right thigh into your foot in an effort to maintain your midline. 5. Square both hips to the front of the room, keeping your left knee moving out to the left. 6. Firm your outer right thigh by contracting the quadriceps muscles, or the front of the thighs. Zip your belly in and your lower ribs together. Lift the chest and bring the shoulder blades down. 7. Take 5-10 deep breaths, finding length on each inhale and rooting down with each exhale. 8. Exhale and release the left leg back to standing straight. Repeat on the other side. 1. Lie down straight on your yoga mat. 2. Place both your hands on the sides. 3. While you inhale, your stomach should inflate. While you exhale, your stomach should deflate. This movement should be like a balloon. 1. Sit down straight with your legs together by stretching in front of you. Keep your head neck and spine erect. 2. Place the palms on your respective knees. 3. Now bend your head and trunk slowly forward to catch the toes with the thumb, index and middle fingers without bending knees. 4. Take a deep breath and exhale slowly. Try to touch your head to your knees. 5. Bend the arm and try to touch the elbow on the floor. 6. Exhale completely and holding out your breath, stay in this posture for a few seconds. 7. After a few seconds, slowly return to your starting position. 9. Repeat this 3-4 times with 8 counts. 1. Sit straight with both legs folded. 2. Let your back and neck be in one line. 1. Sit straight with legs folded. 2. Extend your arms sideways. 3. Rotate your arms clockwise in the first circuit. Do this for 8 counts. 4. In the second circuit, rotate your arms anti-clockwise for 8 counts. 5. In the third circuit, repeat the same with your shoulders.